I don't usually have much luck making layer cakes. My pans are slightly different sizes which makes stacking problematic, the batter usually rises in the middle making the construction even more precarious, I'm not patient enough to let the cakes cool so I can't get them out of the pan in one piece, the frosting usually melts (see character quality of impatience, above), etc., etc. 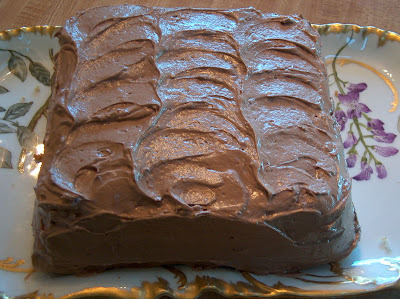 This cake, however, a white cake with a hint of lemon, topped with buttery cocoa-coffee frosting, turned out perfect. The recipe is from 1916. It's one of the stash I inherited from my great-great-grandma Hattie. If you zoom in on the picture, you'll see in the upper right hand corner the date, 6/17/16. How cool is that? A recipe that's almost 100 years old. You'll also see it is actually another Mrs. Borwell recipe (see Mrs. Borwell's Fingers here). I figured if Mrs. Borwell could do the fingers, I could probably trust her to do a good cake, too. You might also note there are no directions on this recipe, just a list of ingredients. C'mon, Mrs. B., give a girl a little help, will ya? I turned to one of my trusty regular cookbooks for advice on what exactly to do with all these ingredients. I also made the executive decision to double the frosting quantities listed on the original card. It was a good call. 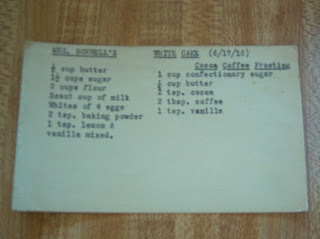 After all that effort, I've decided I have earned the right to re-dub this recipe: It is now Great-great-grandma Hattie's Cake. In large mixing bowl, cream butter and sugar with electric mixer for a couple of minutes, until blended. Add vanilla and lemon extracts and egg whites; beat until blended. In separate bowl, stir together flour, baking powder, and salt. Add dry mixture to batter alternately with milk, a little of one then a little of the other, until all dry ingredients and milk have been used and mixture is well blended. Grease and flour two 8 x 8-inch pans. Pour half of batter in each pan, and bake at 375 degrees for about 20 minutes, until toothpick inserted in center comes out clean. Using electric mixer, cream butter. Add about half the powdered sugar, blending well. Beat in cocoa, coffee, and vanilla. Gradually blend in rest of powdered sugar. For best results, let cakes cool before taking them out of the pan and frosting. An added side note: this plate is one that Hattie herself painted. Her initials are on the back, along with the date of 1893. Anyone else have an Heirloom in Autumn post you want to share? Well, bless Great Grandma's sweet little heart! How precious that you have one of her recipes! :) That's fantastic! The cake looks sooo good...glad it turned out perfect for ya. And thank you for sharing that little gem with the rest of us. I LOVE that plate!! What a treasure you have! I love the plate and I am a collector of antiques. "Antique" recipes are the best! I have my mother's cookbook, a wedding gift from 1935. I post on it months ago before we met. I will try to pull it up again for tomorrow. I had not picked a post yet. What a beautiful plate. I wish I had that recipe to take to a card game tonight. Well, maybe I will make it next week. What a lovely recipe! I love all thing old, they are simply the best. That plate and cake look just devine! I am definitley going to try that one. I am guessing the egg whites are to help the "white cake" stay a nice white color. Thanks so much for sharing this wonderful post. Rainy Day Farm, I think you're probably right, that egg whites only are to keep the white cake white. I think I'll try it next time with two whole eggs, though, and see if it makes any difference in the taste or texture. Who cares what color the cake is?! Tammy, I use 8 x 8-inch pans only because it's all I have ;) I keep thinking I should go to a real cookware store and buy some real, round cake pans. But the tightwad in me just has never done it. My great-grandma was a Hattie too (born in 1901 though) so I get a special kick out of seeing your Grandma Hattie recipes. I've posted a couple of recipes from a 1956 cookbook that I found in a thrift store, but what I'm really dying to get my hands on is the cookbook my mom has that's even older! She doesn't have any hand-written recipes to pass down though as the recipes in our family are usually just eyeballed. I've been making an effort to write them down for my own children though! P.S. Check out the Blender Cake recipe I posted a few months ago - that was a fun one!! The cake and plate are both beautiful! I'm anxious to try the cake recipe.....and I love that you used the square pans. This looks like a keeper to me! See you at Starbucks tomorrow! "And thanks for stopping by my blog. How interesting, that you had a great-grandma named Hattie. Don't you just love that name? My Grandma Hattie named her daughter Lottie. Another name you don't hear too often ;)"
My g-grandma's name was Hattie Cecilia, and while I didn't love the Hattie part enough to pass it on, my 3rd daughter is our sweet Cecilia. Great-grandma's mom's name was Elida Jane, and grandma's name is Lydia Jean... so our little Ceci is Cecilia Lida. And yes, the room has been a lot of work so far, but the girls are all LOVING it. I'm hoping the boys room goes much, much quicker. Great family names, Sadie. Cecilia is beautiful; so is Abigail. And so is Sadie, for that matter. Good luck on redoing your boys' room. You'll have to post pictures when you have something to share. Pam -- I'd use round pans if I had them! Guess it's time I broke down and went shopping, huh? Thanks for sharing this recipe, Lynn. I love old cookbooks and recipes and this cake looks so good. God bless Great-great grandma's heart for leaving these recipes for future generations. Very precious. I love those kind of old classic recipes! This looks delicious! It would be just my luck to stumble across the makings of a delicious dessert and it not contain any actual instructions! If ever I do, I'll know who to turn to to help decipher the intent. I guess back then they figured EVERYONE knew HOW to make the cake - it was what went inside that was special. What a lovely cake! I would never have thought to pair a slightly lemony cake with chocolate-coffee frosting, but it sounds really fantastic! And I love your beautiful platter! The cake sounds delicious and looks so good! 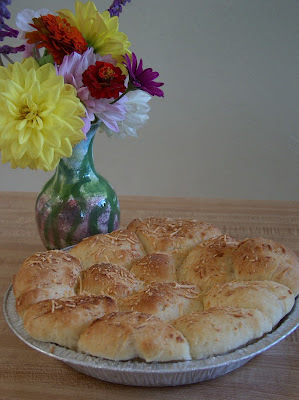 Thanks for stopping by my food blog the other day. I really enjoy recipes that are handed down over generations. I just got my grandmother in law's recipe collections/memoirs and I hope to post some of the recipes soon! Gorgeous Platter. What a treasure. I think antiques take a totally different importance when you have a connection. I'll have to grab out some of my old Grandma Denton recipes. She was our adopted "Grandma" and I have a couple of her OLD cookbooks with some hand written recipes stuffed inside. Thta' so awesome that you have these recipes of your great great grandma AND one of her hand painted plates, too! Btw, the cake looks and sounds good. Sure would LOVE a slice! OH GOOD GRIEF!!!! THIS LOOKS DELICIOUS. I think I'm going to attempt this. i certainly lack the cooking skills you have...but this is worth trying. Oh, I am so craving cake now, lol. That frosting sounds amazing! Thanks for sharing. I have trouble with layer cakes too, but yours turned out beautiful! My Grandmother used to type her recipes too. I love looking thru vintage recipes and updating them. It's hard sometimes because the 'cups' they used back then were sometimes coffee or teacups rather than a measuring cup. Great blog! I bet that cake was good. I love trying an old, family recipe- it's like spending time with that person for a little bit. I love that you have the original typed recipe! This cake sounds wonderful..! I must try it. A hint for layer cakes, grease your pan and cut wax paper or parchment paper to fit and lay flat on the bottom of the pan, pour your batter into pan on top of paper, bake as directed. The cake will come out much easier after it's cooled and stay in one piece...thanks for sharing this family recipe..! K, thanks for the wax paper tip. I will have to try it on the next regular cake I make. 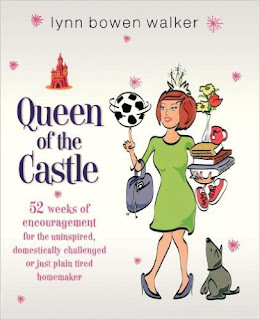 I must say, though, I tried it last week on the Julia Child chocolate cake I made and it did not work at all! The paper totally stuck to the pan. Ugh. I will try again with a different recipe, though. I will. I promise.